Hello my green goddess friends, how are you doing on this glorious Thursday? I wanted to share a healthy eating tidbit with you today because I’m a believer that if you eat good, you feel good and I think we all deserve to feel that way. You guys know that I am certainly no master chef but I do make conscious choices of what I put into my body and when it comes togreens well, we are basically BFFS. Greens help me maintain healthy skin, consistent energy and feel confident of what stares back at me in the mirror. Whether it’s at lunch, dinner or some days both – I’m a salad lover. Salads tend to get a bad rep but I think that is totally unfair because what did a salad every do to you?! If you mix it up just right, your taste buds will be doing a happy dance and your body will be signing your praises. Oh, what was that? You don’t “have the time” to cut and chop all the veggies and lettuce to fuel your body? Well wouldn’t you know it that I have a solution for you! Here’s the thing – I am all about convenience too and with Taylor Farms, you get the pros of a convenience without sacrificing the quality. Fresh, flavorful greens created off the foundation of enjoying vegetables – YES PLEASE! 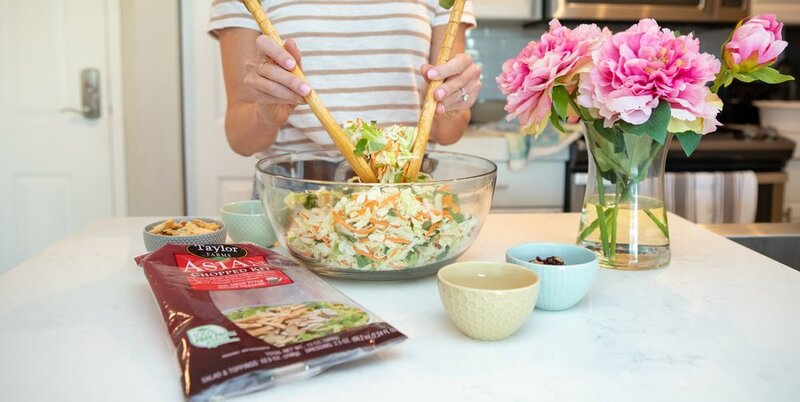 Their chopped salad kits are my life- saver when it comes to whipping up a nutritious and delicious meal, in no time. Their honest ingredients are a perfect way to get your veggie fix in! I love having options so I’ll typically buy three different flavored chopped salad kits to keep my taste buds happy throughout the week. Another great thing about the salad kits is that you have free range to make it your own. Want to add more toppings? Toss them in! In the need of protein? These salads are a perfect base for you to mix it in! Making dinner for one? GREAT! Save the rest for your lunch tomorrow or only make half the bag. 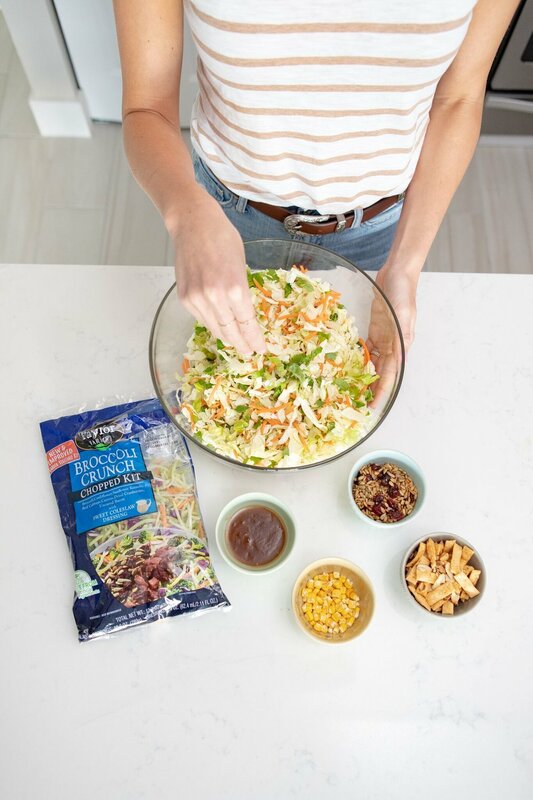 Point being, Taylor Farms chopped salad kits are the perfect fit for you – regardless of your lifestyle. Robby and I are big fans of the broccoli crunch and the Asian chopped kit. You’ll have to message me and let me know your favorites!